You started your blog with all the care you could. You nurtured every blog posts with hours of planning and additional hours taking care not to make any beginner blogging mistakes. In the hope of reaching your perfect audience and getting the blog to where you think it deserved ... you shared each post on every social media platform and every Facebook group you could join. I know, because I have been there too. I have also had my fair share of rookie blogging mistakes. But now, I can proudly say that by rectifying the blogging mistakes I made as a beginner blogger, I make a living online. About 95% of bloggers who aim at starting a blog quit halfway. They just quit even before making a single buck from their blog. Because, they don't have the proper action plan of things to do after registering their domain. I know money isn’t everything, but if you’re blogging for business, writing to add that extra income to your family budget or quit that nagging job, money sure means a lot. As bloggers, you and I are battling for attention in a distracted world. It is very hard to hook your readers to what you are saying, leave alone selling them something. But, at the end it all sums up to one thing. We have to try and give our best no matter what. Failure is just one more chance to re-evaluate your strategy. Let’s start with the dumbest blogging mistakes that you must avoid like the plague. If you want to build a successful blog from scratch, you need to find better keywords that increase your traffic. (HINT: Use LTP to find hidden gems that your competitors can’t). See, if you are not using the keywords that your target audience might type on Google, how can you expect visitors coming from Google to read your content? Always focus on finding more than 3 to 4 long tail keywords. Also make sure to choose the keywords that have monthly search volume less than 2000. By selecting and using the less competitive keywords, you will not only rank higher but you will get faster results. Get access to keyword research tools like Long Tail Pro, SEMrush, and Kwfinder (5 free searches per day) etc. Get to know how to use them. They all have free trial versions which allow you to get the best keywords list. If you are happy with them, go ahead and buy! Find out what keywords your competitors are using to increase their traffic. Find out if you can use the similar keywords to increase your blog’s traffic too. Watch it before moving forward, you'll love it and go back with lots of tips to improve your blog. Blogging is a business, not a hobby. Sadly, most beginners don’t realize this fact. They expect to make money blogging without investing back any into their blogs. This is one of the biggest blogging mistakes you could make, ever! Although you don’t have to spend thousands of dollars to create a profitable blog but you should definitely invest money on getting a good design, web hosting, having access to the right tools etc. If you are looking to make money from your blogging efforts and take advantage of all the benefits of blogging, here are few places where you should consider investing money. See what tools I personally use. Tools, plugins or themes: Isn't your blog your virtual office? If yes, then why not brand it with a premium theme. A premium theme, apart from making your blog beautiful and easy-to-convert, helps boost your blogging credibility. When someone visits your blog and sees you have invested a good sum in your blog maintenance, he or she knows you are here for business and not running away. Similarly, a premium service like Tailwind can boost your blog's visibility on Pinterest and drive you a lot of traffic which would obviously bring you good return on investment. But for that, you have to get off and invest a minimal sum firsthand. Invest In SEO tools like SEMrush: I have been using SEMrush to find out some real profitable keywords that aren’t hard to rank even without backlinks. Check out my SEMrush review and tutorial guide to see how you can use it to discover untapped keywords and even spy the keywords that your competitors are targeting. Hosting: Web hosting is extremely crucial. It not only decides your overall site speed but also search rankings hugely depend on it. So make sure NOT to go for a cheap or free hosting that usually goes down. Invest money on a reliable hosting service like Inmotion, Bluehost etc. (For this blog, I use WPX hosting (read my WPX hosting review for 2019) , it is a bit costly but provides free SSL and security, backups and brought my blog speed to under 2 seconds.) Did I say that blog speed, SSL (that https markup in the URL) are Google ranking factors? Outsourcing: Blogging takes too much time whether it is for content creation, SEO or managing your blog’s traffic sources. If you are not willing to put time on your blogs, try considering spending money on outsourcing those tasks which will pay you in the long run. When I started blogging, I used to read these beginner blogging tips that always advised on creating an email list. And I always thought to myself, I don't need those. I have a measly blog traffic, who will subscribe to my list? No matter how much traffic you get from Pinterest, no matter what SEO techniques you follow to rank on search engines like Google just remember one thing, you don't own them. This is when I knew I had to build a email list of subscribers who I own and who own me. Having your own subscribers is great because you can connect to them when you want and they can reach out to you when they want. If you are not yet building your email list, you're leaving money on the table! Getting started with list building is easy. I recommend and use Convertkit. (Instead of using Mailchimp which is a great free option, I recommend investing some bucks and getting yourself better equipped from the beginning (don't commit the blogging mistakes I committed). With Convertkit, you can segment customers based on their interest which is a big thing as you get targeted readers = targeted sales). Click here to read how I used it to increase my list size! Give an incentive to your visitors. No one likes to give their email without any freebie. eBooks are often easy to create and help you quickly boost your list. Or you can create a checklist. I use my FREE SEO Checklist (click on it to see the optin box) to entice subscribers. Use more email opt-in forms to get more subscribers. Put them in your sidebar, footer, about us page, landing pages, popups etc. Use Thrive Leads to create opt-in forms that convert. For me content upgrades created via thrive leads works the best. Liking the tips to grow your blog so far? Discover 7 more blogging mistakes and the best blogging advice to overcome them. Content is the king. It doesn’t matter how much traffic or money you put, without creating engaging content, you can’t make a blog popular. Even Google came up openly to declare that content is one of the top 3 ranking factors along with backlinks and rankbrain. If you are struggling to increase your blog exposure with your content, try implementing the following content writing tips. Find out what your audience wants: Define your target audience before you create any content for your blog. That way you will be able to create laser focused content that attracts more social shares, links and sales. Make your content/grammar error-free: You could use the free Grammarly browser extension (check out my Grammarly review and tutorials) for that or download this free grammar cheat sheet as a handy solution. Are you struggling to make money from your blog? It might be mainly because you don’t have a proper monetization plan. Without creating a strategy to monetize your blogs, you won’t get any better results no matter how hard you try. Every beginner should know the importance of creating a blog sales funnel. Find out the ways to turn your normal website visitors into email subscribers into buyers. I have recently invested in a premium plugin called Thrive Ultimatum (read my hands-on review here) so that I can show exact affiliate products to my niche site readers and increase sales. This plugin can help you in setting up campaigns like the ones you see with countdown timers (ex: offer expires in 7 days). This type of hype and showcase of scarcity situation helps your visitors buy your product faster. So far, I am earning awesomely using that plugin. Email list also comes into handy for business blogs or while monetizing a site. It can quickly help you build awareness about the products or services you promote. Connections are everything online. Without having connections, there’s no way for you to create a profitable blog that makes money. Observe any successful professional blogger like Pat Flynn, Neil Patel, Darren Rowse and you will notice that they all have spent a lot of time in building loyal community around their blogs. And that’s how they were able to build million dollars websites online. Even you can do that by focusing on creating fans for your blogs. Unfortunately, most beginners spend a lot of time in pleasing Google. If you chase your target audience, Google will give you best rewards. It’s as simple as that. Backlinks are the backbones of any website that gets huge traffic from search engines. Without building quality contextual backlinks, no matter how much content you create won’t get good results in Google. Here are few effective link building strategies you can try to quickly boost your overall search engine traffic. Nothing beats engaging content that naturally attracts a lot of links. Spend a lot of time in writing in-depth articles and you will have better chances in getting more links from other blogs. Make sure to link out to other bloggers frequently. Do let them know about it whenever you link out. That way sooner or later, they will also start doing it when they find your content really informative. Guest posting is the most effective way to build backlinks. Try to write for top blogs in your industry and it can quickly help you boost your overall domain authority and backlinks. If you follow the next 3 blogging tips, you'll agree that they're perhaps the best blog tips you ever read! Seriously, most bloggers (especially when you're beginning) check their traffic stats every single minute. It’s a complete waste of time. When you are building a new blog, you should focus on spending your time increasing your traffic not checking the stats. If you are struggling to increase your blog traffic, try the following things. Create viral headlines that make people to immediately click on your posts. Learn the art of proper on-page SEO optimization. Always perform keyword research as I discussed earlier in the post. It’s a must to increase traffic to any website. When creating a new blog, most people make a mistake of writing content only for their blog. See, how can you reach wider audience by creating content for a new blog? Blogging is all about reaching more people and eventually increase the exposure to your blog, right? That’s the reason why you should start creating the best content for other blogs. Write guest posts for them and you will get a lot of traffic to your own sites. Try writing 1 post every week for any better blog in your niche and within a few months, you will not only build a lot of links but more importantly you get more exposure. Social media is becoming the new SEO. If you are struggling to boost your search traffic, you should give a try to social media. You can easily leverage social media traffic by connecting and reaching out to influencers on social media. Find out how can you help others with your content or tips and make sure to go viral with your stuff. You can consider creating funny images, memes, Infographics etc. to quickly reach more audience on social media. DigitalGYD has some beautiful infographics that have earned Swadhin some awesome backlinks and shares. Check them out here and here. Also make sure to create compelling headlines. I hope you liked my collection of blogging mistakes got tips to rectify them. Blogging is hard especially in the beginning. You will not only struggle to increase your traffic but also sales. Every professional blogger who is making a lot of money from his blog was once a beginner and everyone makes mistakes. Building a successful blog depends on how quickly you learn from the mistakes you make. So what are the blogging mistakes you made that cost you really badly? Share your thoughts in the comments below so that we can discuss them. Very helpful and informative post on blogging mistakes! We all make mistakes but having someone list them and show how they can be fixed will help make blogging for beginners easy. I need to start using social media more to help with getting more views to my blog. I will finish reading this post later when I start writing my newest post that way I can use the tips while I’m creating the new post. So I can see how much the tips help with the post. Well done. This post has some good tips to help bloggers improve on their blogging game. I really learned a lot especially to do with Keyword research. Thanks for sharing. Investing in my blog was the best decision I made Swadhin. As for the list it is funny; I saw much more success by not building a list. When I tried, it felt heavy. Didn’t vibe with me. Folks just bookmark my blog, return and prosper me. I am unforgettable LOL so no need to see my emails. I am in my reader’s hearts. I dig your list buddy. Definitely valuable tips! Guilty as charged for checking the visitor stats of my blog several times a day. It’s so hard to quit though! I think I have a solid plan to make some profit on my blog, and I’m going to invest the profits back as soon as they start flowing. I’ve been blogging for seven years and my SEO is practically non-existent. With 700 blog posts, I should be getting at least that many views from search per day. I don’t think my old posts are being crawled. I’ve been doing the opposite with long-tail words, and use the most popular. Mistakes were made! I have a subscriber list of 10,000 through WordPress but haven’t started a mailing list. I need to write a pdf for a giveaway. Lots to do! Such a great blog post! Each point you make is useful. And I made pretty much all these mistakes at some point. I had to take a break from blogging in May due to health issues and now I am struggling to get back to it. It’s daunting to see how my stats dropped while I wasn’t posting (even though I expected it since my blog was still new when I had to stop). One thing I love now (and underestimated before) is interacting with other bloggers. Either through comments or on Twitter. I really love the blogger Twitter community, you can meet so many nice people & make friends. Very in-depth article for bloggers to follow. I especially like #2. Most bloggers want to start a business while spending nothing and expect it to make them lots of money. To be successful at anything, you need to be willing to invest in it. Blogging is no different. Thanks for sharing. #2 is the blog career killer Swadhin. Folks try to start a small business called blogging without spending a dime on their small business. Offline this equals failure. Online this equals failure. Rocking post! Couldn’t agree more. If you wish to earn or build your blogging business, you have to invest in your blogs. Luckily, most investments are far less than what we have for offline businesses. If that’s something someone hesitates, surely their blog will be having this biz-disadvantage than others. Thanks for stopping by, Ryan. It’s a treat to interact with you. I’m doing so many things wrong! This was such a good article with solid advice. One thing I’m curious about but haven’t read about anywhere… what does “normal” traffic look like in the first year of a blog? Hard to gauge how I’m doing! Wow this blog post is amazing! I have my blog for over a year now but my blog traffic is terrible and I am not making money! I am saving your blog now as I feel like it will help me a lot! Thank you! Hey, fab post! Great content and tips, especially for a newbie like myself. Definitely see SEO everywhere and, thought overwhelming, a huge area to work on to go from hobby to professional blogger. Thanks for sharing your top tips. Let me know how these go for your blog, Catherine. Thank you so much! You always provide an in-depth study. Very concise post! Thanks Sukanya. What are the worst blogging mistakes you’ve made? So this was the kick in the pants I needed… I’m making 4 of these beginner blogging mistakes! Thanks for the info. I will be referencing this often! I never thought of utilizing some of these products. I will have to look into them more and get an email list going! Great post. 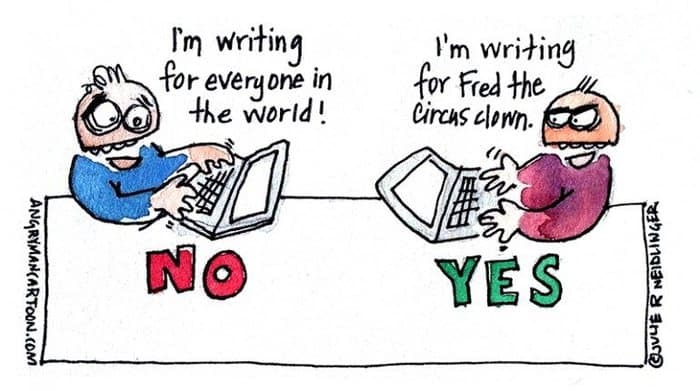 I will have Fred the Circus Clown in my head all day today, trying to stay true to writing to the right audience :) So many tips to help out a blogger I really appreciate it! I have to say you are absolutely right about #3. My email list is really small and I only send them my latest post. I really have to work on this one! Thank you for reminding me and motivating me! Great post! Guest posting is something I always mean to do more of – but never seem to get around to. Thanks for the reminder! Great advice! I have personally been stuck with my blog for a very long time. I do keyword research, write for SEO, and have recently started guest posting, but my traffic won’t budget. Your device gives me hope! These are extremely useful! I actually bookmarked this page to get back to the tips again when I refine my blog further. Great tips! I have been asked to blog on other sites, but was not sure if I should take the bait. What do you think? You should definitely take the chance to guest post on other blogs to leverage their reach, audience and authority to grow yours. Just remember, go for legit sites, in the same niche you’re blogging in, and having a better ranking/authority than yours (you can get an idea using tools like Ahrefs, or free ones like Moz’s domain authority ). I feel like overall I’m doing pretty well at these things as a 1-month new blog, but I’m just now starting to work on getting back listings/guest posts, etc. Thanks for sharing. I am new to blogging and these are such great tips. There’s so much to think about and it tends to overwhelm me. This list is a nice way to help me organize all that I should consider. Great tips! I’ve been hesitant to invest money in my blog. I think that might be the next step for me. This is full of great blogging advice. Most of these I had to learn the hard way (and I mean HARD way) and some I am still figuring out. Very useful blogging tips! Seo is my kryptonite. My goal for the month is figuring out the SEO and implementing it to get more traffic…thank you for the tools! Love this post! It has so many important factors listed in growing traffic. One thing I didn’t realize I had to work more on is keywords, so thanks for that tip! So true. I’ve been blogging for only a couple of months now. There’s still so much for me to learn about blogging. I’m currently trying to improve my keyword research and implementation. Thanks for the blogging tips. I didn’t know that about long tail SEO. I had been doing the opposite. Does that pertain to titles too? I’ve been getting hardly any search through Google and think it’s because I’m using a theme that doesn’t summarize my posts. I had added my own read more tags, but I don’t think crawlers can get past them. I’m researching new themes and will see if that does the trick! Great post! I am finally drilling down to a specific audience rather than trying to write for the whole world. SO I loved your cartoon that illustrated that. Doing this has boosted my confidence that my audience is going to feel good about what I am writing. Also, guest blogging really is a great way to gain readers and exposure. I see a direct link to my sales numbers on Amazon when I write for someone else’s site. So, fantastic advice all the way around. THis was a great list and all 100% accurate. I love reading posts where you know wha tthe blogger is talking about. Great work, Love all the info! Pinning and will share in my blogging FB group. Thanks for sharing! I just started a blog almost two weeks ago and I’m having with keeping people on my website. I hope to put these tips to use. I’m still confused on monetization but hopefully I’ll get to that point. It is always a good strategy to think about monetization after your blog receives some momentum (page views, readers. rankings). Keep us informed about your blogging journey (I hope you avoid these blogging mistakes). I totally agree with your points. Building a list is paramount if you want to succeed online, most bloggers give little focus here only to discover later that they really would have started building it immediately they embarked on their blogging journey. I agree. Becoming cautious of the most predictable blogging mistake and avoiding them beforehand is the key. I can’t lie. When I first started blogging, I made a few of these mistakes. I learned quickly though and got my act together. I am glad you took the right path and overcame these blogging mistakes for the good. This is post on common blogging mistakes is very helpful. I focus more on content and put in more effort to make it worth reading and keep them checking my post but the one i will work on soon is building the mail list. Thanks. Excellent share. I agree with you on all points but #3 has to be most important for myself too. Depending on SEO or social media traffic can one day hurt you when a new algorithm or change comes in! Email subscribers will always be there to support you and available to contact anytime with a personalized note. Wow, this is so useful, thanks for sharing! :) There’s a lot to learn for a newbie like me. I can’t wait to get rid of these mistakes! So many tricks and ideas on how to improve blog. Let me apply them immediately. Big thanks. This is a very helpful post, made my share of mistakes too. Thanks for sharing! I think that you’ve made some great points here, but do you believe that the longer post length applies to all niches? Food bloggers get frequent complaints that their articles are too long (only about 300 words) because people just want to jump to the recipe. Thanks – I’ve made a number of these mistakes. I’m auditing my blog content so I can start making some affiliate income next year. Great tips – I have been blogging with a personal blog for 7 years, and recently started a travel blog, and it’s a lot of work, but also it’s a great way to share knowledge and ideas with alike readers. I am struggling so much to get traffic to my blog, especially through email subscribers. Thanks for the tips! I’ve already signed up through MailerLite to try the program out and see if it will help my mailing list. Great post! I’ve made a few of these mistakes, but I’m course correcting. I’m upping my keyword research game and working on my monetization strategy – basically my #1 focus for my blog right now. A lot of food for thought there. Each item on that list is so important to build a business, and yet so easily ignored. I have a lot to think about after reading this post. I have not properly built an email list and I KNOW I need to!! I don’t know what’s stopping me! These are some great tips. I am just now working on an email list because that has always been intimidating to me. It is so important though. This is great! As a new blogger I am making a lot of mistakes. Thank you for this list. I am going through the list and making changes today! I love these. I just finished a year from my blog. I just started getting sponsored posts but have had a hard time driving sales. I’ve had a few but nothing concurrent. I will say social media is key to driving those sales. Yes social media is the key and guess what SEO is a greater key. When your potential sponsors will see your page ranking for their potential keyword like suppose a shoe brand is seeing that your article about “best shoe to wear on a vacation under $100” or something similar they will contact you to write similar post or place a link of theirs in that post and will pay you for that. Tip number four was really helpful for me! Thanks! So many great points! Thank you for the info on building an email list! I have been struggling with that and really want to focus on it heading into the second half of 2017. Can’t wait to check out Mailerlite! Awesome post with really great advice! I’m bookmarking to refer to often. Awesome and informative post! I am a newbie blogger, 2 months new ? I have got to start getting a hold on my email subscribers for sure! Thanks for sharing! This is a fantastic list! As a new blogger it is extremely beneficial to me! I definitely don’t do enough of keyword search. I’ll, from now on, try to avoid these savage blogging mistakes and save my blog. Keyword research is the key to get a load of buyer intent traffic. People often search on Google for their problems may it be best XYZ under $100 or how to get rid of social media or how to cook rice everything on Google. If you have a post related or targeting these keywords you are sure to get profitable in the blogging business. Thanks for sharing this. I’m just now learning about email marketing and building a email list. I started with mail chimp but my subscriber list is not growing. I noticed my pop doesn’t always pop up. What do you use as your pop up? It can be really scary when a tool doesn’t work as expected. You could use the free sumome set of tools to create popups for free (very limited, though) or use what I use (Thrive leads) which is one awesome of a plugin. You can create content upgrades, two step optin forms, exit pop ups and welcome mats and much more. These are all fantastic tips! I have been blogging since February, and just recently started building my e-mail list and investing money into my blog. I am a stay at home mom with 3 kids under 3, so trying to find the time to do everything I need to do to make my blog succeed is really hard. Slowly but surely, I will get there! Great tips! I really need to focus on using more keywords and also building my subscribers list! Awesome post!! I wrote down the ones I need to focus more on — so the advice is great. Sometimes it’s hard to notice if you’re doing something that may not be good for your blog. Thanks! This is so spot on! I blogged for over 7 years making about every mistake you’ve mentioned. Only in the last two months have I decided to invest in the methods you suggest and already I’m seeing a marked improvement in my traffic and email list! These are GREAT tips! I need to focus more on keywords! This is a great list, thank you! I really didn’t know most of these things, so I’m excited to start implementing them. WOW! A lot of great info. I have been blogging for almost a year and still learning everyday. Pinned this for reference! These are great tips! I definitely need to start focusing on keywords. Thanks! These are things that even people who have been blogging a while need to remember. I know that I need to work on building my email list a little more, so that I can get more traffic that way! Great tips and timely for where I am! I get a lot of advice from blogging experts and some of it contradicts each other. I appreciate straight-forward advice. This is a great informative post. I’m pinning it so that I can delve a little deeper into it later. I so need to work on the whole email thing. This post is really informative. I will try to build up an email list now. Thanks! This is such an amazing list of tips. I need to focus more on developing backlinks to my site! Man, this FULL of great information. There’s so much that goes into the building of a blog. This is a great resource to keep returning to. Thanks for sharing. Thank you for this post. I am still semi new and I needed to read this. These are such great points for bloggers that are being held back. These are great tips! I need to get better at continuing to grow my email list. These are seriously such great tips! Thank you! These are excellent tips. I’m a relatively new blogger and I’ve been held up on #2 for a few months now. I spent some money in the beginning to get my website up and running and now I struggle with how much to spend to expand my reach. I ultimately want this to be a source of income so I know I need to treat it as a business, but it’s hard to know where to spend money to make the biggest impact. Good point about the importance of building community. As someone who witnessed significant growth with my personal blog when I started sharing my content in Facebook groups, I’m a huge believer in that. I even tell my clients to try that sometimes. Aw man, calling me out! When I first started I used to check my stats ALL the time. Now, I know better. Let’s focus on what’s important, driving AND converting traffic. This is a fantastic list, every blogger needs to read this! Love your tips on blogging mistakes. I have made some of them, particularly not focusing on my email list. However, I planned to wait a year before trying to monitor and to focus on building an audience. I am pretty happy with my view now and plan to monetize soon. Thank you for sharing the article, it was extremely interesting to read. I’m working on creating a way to gain passive income over time. Great points. I need to work on a tip or two from this article. Thanks for sharing! Great post! I found out a long time ago that not spending money on my blog was never going to work. Thank you so much for such useful points. I will surely try to incorporate them into my blogging. Keep sharing such beneficial tips! Great post! I definitely need to learn not to constantly check my blog stats. It’s just so exciting to watch the numbers change! I am most guilty about checking blog stats every minute. lol. Also, I am nervous about guest writing for other bloggers mainly because I only started late last year and I don’t know if they will find me good enough. But some of the other suggestions though I have already implemented. However, I need to spend more time doing keyword search this is an area I am struggling with. Thanks for sharing these tips. Great ideas Anil! I’m definitely already doing most of these. And that’s the reason I went with paid hosting and a good theme to start. Now I have to invest some more time into building back links so I’ll be looking into that soon. I really like your advice on outsourcing. I’ve been thinking about outsourcing my SEO. These are really good tips to keep in mind. What a wealth of information, thank you Anil! My blog is only 2 years old and I’m learning as I go. I do need to start an email list and also learn more about my Adsense account. But hopefully I’ll get there! This is very helpful information! I’m pinning it for future reference. I’m still in the beginning stages of blogging, so I’ll admit that a lot of it is advanced for me. I’m trying to learn, though! Building my email list is on my to-do for sure.. i feel like it’s a great way to engage and capture the attention of readers. Now if only i could compile all the content! I’ve been blogging since 2012 and am only now figuring out all this stuff! I’ve taken an SEO keyword course and now I need to build out a newsletter! Thank you so much for these tips. It will really help me a lot. I already started these tips in my blog website. Waiting for another post something like this. Thanks Swadhin for sharing this to us. You got me at not investing in your blog.nice post I must say. Great tips! I see a lot of blogger neglect growing thier email list. Sometimes I don’t think they know the value in it. Thank you for this article!! Love the concrete, actionable steps. Informative tips. I will borrow a tip or two from this article. Thanks for sharing! Very helpful post! I’m new to the blogging world and I’m always looking for advice like this! Hi Fris, I know having a custom domain makes your site more branded. Shows your users that you are a real person accountable for what you say because you have invested in it. Plus a custom domain improves your search engine rankings. Such a great information, thank you for sharing this. I will be reading more about this post. Wow! So many great and useful tips! I will try to work harder on my email list and SEO optimizing! Thanks for sharing all of this with us! Thanks for the tips! This is really helpful especially to the aspiring bloggers and those who wish to still grow their blogs. These are all so true and all things I did i the beginning! I’m finally starting to see some traffic and results! Yay! I am so very glad you found it helpful. Please try these tips and let us know how it goes. Thanks for sharing these tips! As a new blogger I’m definitely making several of the mistakes you mentioned- in particular I’m not doing keyword research ? I’m going to read up some more on that! This was a really great read with a lot of helpful tips. Thanks for sharing! Great information here! I switched from blogger (where I was for 8 years) to self-hosted WP a year ago and have been working to grow my blog since then. There’s been a steep learning curve, but I’ve been figuring it out. Right now, I’m working on growing my email list. I’m building a resource library for subscribers little by little. I never realized how much time went in to building something like this, but it’s my creative outlet and I love it! These are such great tips and I will definitely keep these things in mind! Great list! I am working through charging up my email list right now & putting a huge priority on it! Thanks for sharing! Great tips! I’m still working on developing my email list and your tips are really helpful! These are great tips! I don’t personally do an email list though. It’s not for me. But I do spend money on my blog and build my social media accounts. One of the biggest regrets I have is not building a list sooner. Many of the biggest names in marketing I know feel the same. I am not saying you should build a list compulsorily but having an alternative source of reaching out to your readers other than Google or social media is a great thing. Thanks so much for these tips. It is a great help for new bloggers like me! As a new blogger, I really appreciate this post. Always so much to learn! This is a great post about beginning blogging with a lot of useful information for all bloggers. I think that writing guest posts can be very beneficial with the right relationship. Great ideas all around! These are wonderful tips. I found this post really informative. Growing an email list and investing back into your blog are my two favorites. These are great tips! I definitely made the mistake of not doing a in-depth keyword search and I know it cost a ton of traffic. I just saved this. Thank you! Creating and launching an appealing and informative blog is not enough. For better results, we need to get serious about its promotion. Social media is an important source of traffic for any website. That’s why even the most popular websites focus on making sharing easier for their users. If we want to grow our organic traffic, need to focus on building website backlinks. It’s the best way to generate more search traffic, even though it is hard work. It helps to grow our personal brand and if done right can boost our search engine rankings. Eventually, thanks for exploring much interesting facts regarding this amazing topic. The first month I started blogging I post fresh content everyday simple because I want my readers to learn new things from me. So there are times that I’m not doing enough research, writing to quickly and not proofreading my content and this kind of routine are really not good. So I’ve changed everything; I only post twice or thrice a week and I take a time to create well-written content. Informative post about mistake in blogging journey. 9th Point is the biggest mistake that a blogger should avoid. This post is just amazing and it opened my eyes that what I’m doing. I’ll surely avoid the above mistakes. You have shared a good information to us. Your way of describing the things so good. It is a good effort made by you. Thanks for writing such Ultimate Post. An excellent share of the great 10 blogging mistakes. And literally I am committing about 8-9 out of those 10. I recently started to invest some money but I am still far away getting many things straighten up. Thanks again for putting up all these mistakes! And happy to share it on my social life! Anil, I’ve made all of these mistakes and I still do a few today like not writing for SEO – keywords like I used to. It’s gotten so much more difficult and I try to focus more on a very specific niche. I also need to link to more bloggers in my posts. Something I’ve gotten away from recently. Thanks for sharing these tips with us, a great reminder for us “older” bloggers and new bloggers alike! Yea, linking out to other bloggers frequently is one of the easiest ways to build relationships. Not only that, it also helps you get incoming links from other blogs. After all, no one finds you automatically and links to your stuff, right? Having made every 1 of these errors, I agree ? One non practical mistake that killed me was blogging mainly for money. Killed my career for 5 years. Until I blogged for fun, mostly. Thanks for the smart share and hey, your family looks great! Saw them on Facebook. I did most of these mistakes in my initial stage. But now I am trying to correct them to grow in blogging and become a successful blogger. My Biggest mistake was not to collect emails. I never thought to send newsletters but now I am understanding the use of list building. Glad to hear you are learning from your blogging mistakes. While it’s so common to make mistakes in any field, but learning them as fast as you can is the surest way to build a successful blog. Informative post indeed! Yes, you mentioned the very mistakes we need to avoid, though most of the newbies don’t get to know they are making these mistakes till some time has passed! Speaking of myself, as I can take my example as best – I didn’t pay much attention to building my email list, until much later, though never too late to start, but that is essential for anyone who wants to pursue blogging as a profession for sure. There is no substitute for hard work, and quality is the key, where content is concerned. I guess Google knows that best, though without keywords it’s tough to rank in the first few pages, but there are several exception even there at times. Yes, you need to write FOR your readers, not yourself, and they will always keep coming back for more, no doubt about it. Building a strong network and your presence on social media are essential for a blogger, or else how would you create your own little blogging community. These were things I was sure to follow when I started blogging, in fact, social media has always worked for me somehow, so I know it does work. The reason why you have built a successful blog is because you spent majority of your time building a great network around your blogs. One thing I particularly like about you is the ability to leave really thoughtful comments. It’s a rare practice by most bloggers these days. It for sure that the things you have shared are really done the by the newbie bloggers. Even I use to make some of these mistakes. When I was a Beginner. Glad you enjoyed the post. Do let us know what are the mistakes you made in blogging that cost you in the long run. Also let me know if you have any more questions. Awesome article Anil. “NOT INVESTING MONEY ON YOUR BLOG”, this is a right at least for me for years. Now I realized the importance of investing to buy the right tools. Thanks for sharing your valuable article…. Yes, that’s the one thing most beginners should avoid. They should invest money and time to build a profitable blog from scratch. Otherwise, it’s really hard to make others to buy from you or make money without investing a penny. Glad you enjoyed the post.